After two days of demos, discussions and networking, the Business Travel Show is over. After the success of last year, we knew we had to pull out all the stops to make 2019 even bigger and brighter. This year Clarity showcased not one, not two but three products with presentations being given on the stand at set times throughout the show. Wednesday morning saw Director of Sales and Account Management Paul Casement and Head of Online Development Ruth Nicholls unveiling Clarity’s new booking platform, Go2Book on the stand, with visitors and press attending to get a first glimpse of our re-imagined online tool. Later in the day Product Manager Will Murray, Head of Management and Information Darren Williams and Data Quality Manager Helen Mairs also hosted presentations of Go2Track and Go2Insight, allowing visitors the chance to observe the full Go2 suite of products and how they work together to improve the traveller, booker and company travel management experience. Our team of experts were on hand throughout the day to discuss our manifesto, Hearts & Minds, which extended a challenge to the procurement community to take a traveller centric approach, shifting focus from the purely cost driven mentality of previous years. Over the last few months we’ve brought familiar industry faces, Clarity experts and suppliers in to our offices to discuss how businesses can truly capture hearts and minds, looking at areas such as sentiment & statistics, wellbeing & profit, freedom & security and much more. 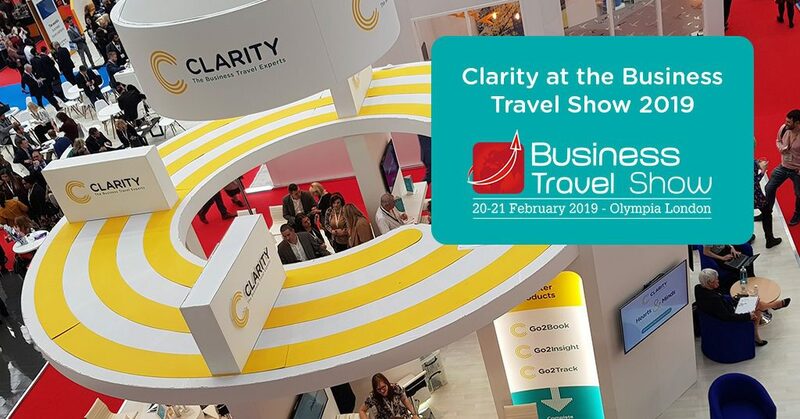 If you didn’t get the opportunity to attend the show, you can still grab a copy of our manifesto by clicking here and of course our business development team are always available if you would like to discuss travel management services or book an appointment to see our demos. Thank you again to everyone who took the time to meet us at the Business Travel Show and we look forward to sharing more news and updates over the next few weeks.